Continue reading Back to ’09.. just don’t mention doping! Posted on January 19, 2015 January 19, 2015 Categories Back Stories, Road RacingTags Adam Yates, Anti Doping, Astana, Cervelo Test Team, Chris Froome, Crankpunk, Etixx Quick Step, Heinrich Haussler, Het Nieuwsblad, IAM, Kuurne Brussel Kuurne, Marcel Kittel, Mark Cavendish, Omega Pharma Quick Step, Orica Green Edge, Paris Nice, Richie Porte, Simon Yates, Team Sky, Tirreno Adriatico, Tom Boonen, Tour Down Under, Velon1 Comment on Back to ’09.. just don’t mention doping! In 2009 Mark Cavendish was embarking on what would be his best year yet but ahead of that edition of Milan San Remo he would have been seen as an outside bet for victory on a parcours which doesn’t tend to favour sprinters. 2009 was also the debut season for the Cervelo Test Team with Thor Hushovd leading the team at a point in his career where he was seen a genuine sprint contender and a rival for Cavendish’s green jersey aspirations at the Tour de France. Part of Hushovd’s lead out at MSR was Heinrich Haussler and as the race entered its final moments he got the jump on the bunch expecting to pull Hushovd in to position to launch for the win. Instead, 300 metres out, Haussler was alone and realising that Hushovd had lost his wheel he began to sprint for the line. The gap from the bunch grew and Haussler, perhaps in disbelief in finding himself in the lead, snatched looks over his shoulder to see who would be challenging him. The sight of Cavendish, low on the bike, winding on more and more speed is a familiar one now and looking at footage now the likelihood of a Cav victory just looks inevitable. Five years ago Haussler looked the favourite, Cavendish catching but surely not winning? Anyone who has watched ‘Beyond the Peloton’ on VCSE’s YouTube channel will know that Haussler agonised about what happened next and probably will continue to do so. If only the line had been closer. Maybe less looks over the shoulder at the oncoming Cavendish. Haussler’s anguish at being caught on the line and missing victory by a bike length was apparent for the moment he realised he had been passed. VCSE was reminded of this watching today’s Paris Roubaix. In what were probably the best conditions enjoyed so far in this year’s monument classics Sep Vanmarcke was beaten on the line by Fabian Cancellara sealing a annus mirabilis for Spartacus and abject disappointment for Vanmarcke. Cancellara played his hand beautifully as the race entered the final third. With Tom Boonen missing following his accident at the Tour of Flanders Cancellara was the favourite coming into the race but such is the lottery of the ‘Hell of the North’ he was unable to call on his Radioshack teammates to help to control the pace this week. Vanmarcke had gone away from the leading group with Het Nieuwsblad runner-up Stijn Vandenbergh as Cancellara began to come through realising perhaps that attack was the best form of defence. Over the final few sections of pave there was speculation that Cancellara was struggling following crashes suffered in the previous week. Cancellara had demonstrated his ability to break from a group and then time trial to victory already including last Sunday’s Tour of Flanders. As he dug in today and blew the group apart one rider failed to stick to the script; Zdenek Stybar. Stybar stuck to Cancellara’s wheel like glue as they reeled in Vandenbergh and Vanmarcke. This represented a potential reversal of fortune for Omega Pharma Quick Step, the chance of at least one rider on the podium at worst following Tom Boonen’s withdrawl, perhaps even a one two. Fate intervened and heart-break for OPQS in the closing stages perhaps overshadowed only by what followed inside the Roubaix velodrome. First Vandenbergh last in line of the four crashed after hitting a spectator on the pave. Worse still Stybar, pinged pinball style from one side to the other of the next section of pave. He remained upright but lost time, momentum and arguably motivation to continue. Cancellara’s often used complaint that rivals stay in his wheel could not be aimed at Vanmarcke who took his turn in the lead when many armchair fans, VCSE included, were pleading for him not to, favouring the underdog in the situation. The Cancellara Vanmarcke game of cat and mouse continued into the velodrome advantage swapped back and forth and speed reduced to the extent that the pursuers were able to catch up to within a lap by the end. Vanmarcke, arguably the stronger in the sprint finish, wanted Cancellara to blink first but by the final corner decided he would have to go for it. Whether or not Cancellara gained some ‘draft’ from riders on the track a lap behind isn’t clear and head on the victor wasn’t even clear until Cancellara threw his arms aloft. Replays showed things more clearly and Vanmarcke’s reaction on the line made his disappointment apparent. Vanmarcke attempts to put a brave face on things on the podium were in vain as he blinked back the tears that showed the emotion he felt at missing out on career making victory. Cancellara becoming a three-time winner of Paris Roubaix and adding to the results that have made him the leader of the world tour should be celebrated but for VCSE Paris Roubaix 2013 will always be about Sep Vanmarcke. Some of the best racing of the season so far took place in the Tour of the Basque Country this week. The weather deterioated as the climbs got steeper during the week. Spanish races tend to favour the steepness over height and these stages were no exception with three days of climbing and summit finishes following the early sprints won consecutively by Orica Green Edge. Alberto Contador is looking fairly mortal this year and Saxo Bank will need to carry out a detailed post mortem after a relatively poor showing from a tour strength squad that included Nicolas Roche and Mick Rogers. Sky should feel pleased with their return after only being able to field six riders. Joe Dombrowski looked the strongest he has done so all season although VCSE feels he is probably unlikely to be selected for the grand tours this year. Vasil Kiryenka looked super strong again all week as he led Richie Porte and Sergio Henao and generally bossed the peloton. Team of the week however was Caja Rural. 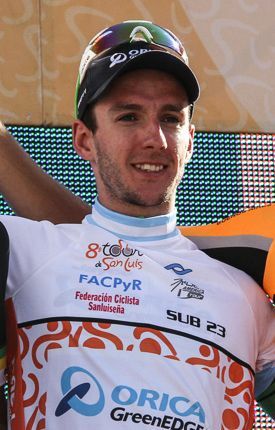 Amets Turruka’s breakaways to win the King of the Mountains and points jersey delivered the metaphorical finger to his erstwhile employers at Euskaltel Euskadi who had a week to forget. 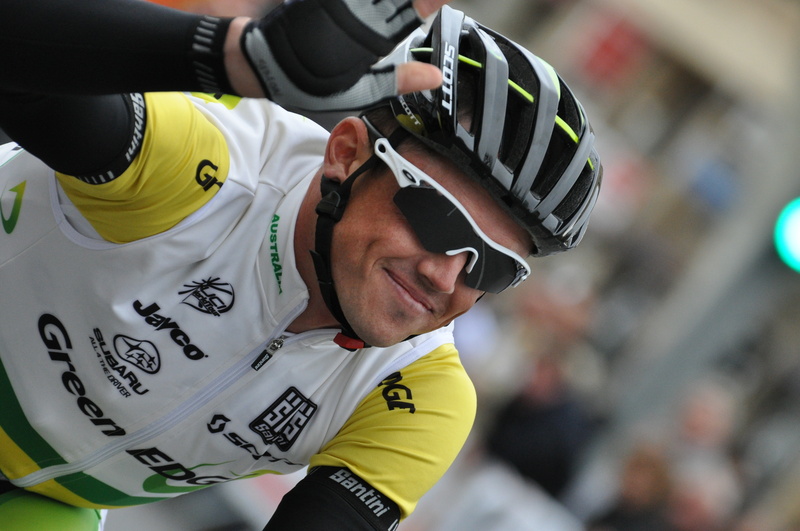 Getting so very close to a win in stage five for Caja Rural was neo pro Omar Fraile. In every kind of the worst weather Fraile stayed away from the peloton until the final climb but unlike so many riders who get swallowed up in these situations he fought on and kept his place in the leading group to finish 15th.